Brain tumour symptoms can include changes to vision, such as blurred or double vision, abnormal eye movements, restricted field of view and more. It is important to remember that brain tumours are relatively rare, which means it is likely that your symptoms are NOT due to a brain tumour. However, it is always important to get any symptoms checked out at an opticians. How might changes in vision show themselves? Changes in vision associated with brain tumours can include blurred vision - for example, you may find it has become difficult to watch TV or read. You may get a fleeting loss of vision lasting a few seconds ('greying out') related to changes in your posture, such as suddenly standing up. Or you may find you have lost part of your field of vision. This could lead to you bumping into objects, or you could feel as if objects or people are suddenly appearing on one side of you. Why can brain tumours cause changes in vision? Changes in vision can be due to the optic disc at the back of your eye becoming swollen as a result of increased pressure in the skull. The optic disc is the point on the retina where the optic nerve enters the eye from the brain (the retina is the layer of light-sensitive cells at the back of the eye). Optic disc swelling can be caused by a number of conditions, but when it is due to raised intracranial pressure (ICP), it is known as papilloedema. Papilloedema can be picked up by opticians during normal eye examinations. This can be important as people don't usually experience the visual symptoms in the early stages of papilloedema. Not all patients with raised intracranial pressure develop papilloedema - this depends on the location and size of the tumour. Also patients who have previously had papilloedema may not develop it in the future. As the tumour grows, or there is a build-up of cerebrospinal fluid in the brain, it can squeeze normal healthy brain tissue including the main cranial nerves within the brain. The resulting pressure can alter how well the nerve works, and if this happens to the optic nerve, your vision can be affected. 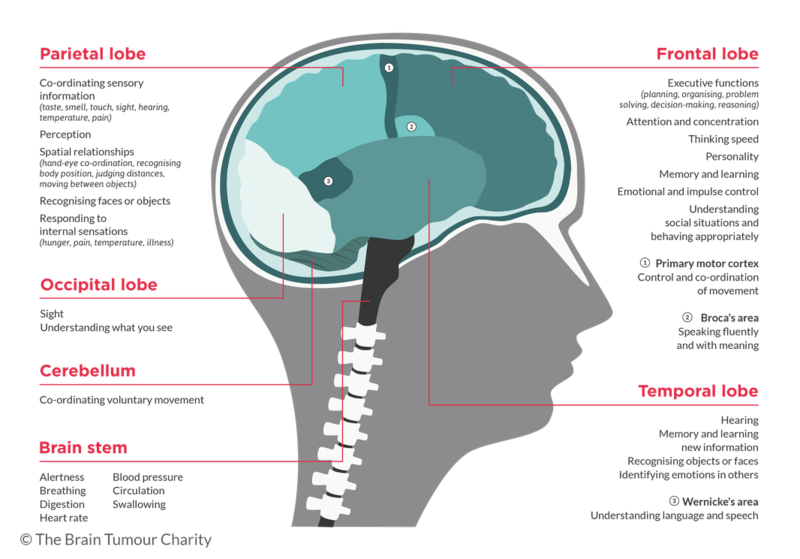 Symptoms of a brain tumour can vary depending on the tumour's location, and several areas of the brain play a part in an aspect of vision. The occipital lobe is the main area involved with vision. It processes the information coming from your eyes, so that you can understand what you see. A tumour in the occipital lobe causes difficulties with vision, such as visual loss, or identifying objects or colours. Alternatively, it may cause loss of vision on one side. Bringing together information from your different senses (touch, vision, hearing, smell, taste) and making sense of it e.g. a person may bump into furniture that they have seen, but have misjudged where it is in relation to themselves. Speaking, understanding words, writing and reading. It can also cause numbness on the opposite side of the body from where the tumour is. Damage to the cerebellum can cause flickering of the eyes, as well as problems with balance, a loss of co-ordination, difficulty walking and speaking, vomiting and a stiff neck. It can also affect the fine co-ordination of the muscles leading to problems with dexterity (skills in using your hands). For tumours in the brain stem, symptoms can include double vision, as well as unsteadiness and difficulty walking, facial weakness and difficulty speaking or swallowing. A tumour in the temporal lobe can affect the ability to recognise objects, as well as identifying emotions in others, hearing, memory and learning.